What Is a Command for Computers? 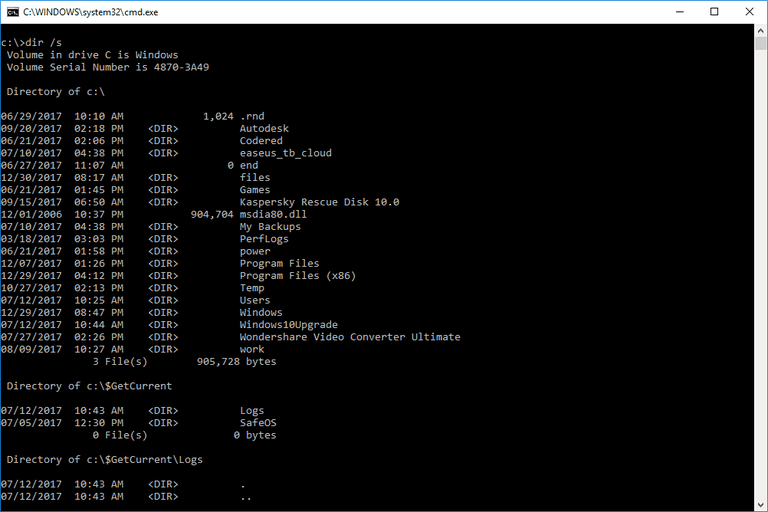 Dir Command in a Windows 10 Command Prompt. A command is a specific instruction given to a computer application to perform some kind of task or function. In Windows, commands are usually entered via a command line interpreter, like Command Prompt or Recovery Console. Commands must always be entered into a command line interpreter exactly. Entering a command incorrectly (wrong syntax, misspelling, etc.) could cause the command to fail or worse, could execute the wrong command or the right command in the wrong way, creating serious problems. There are many different kinds of commands, and many phrases that use the word command that probably shouldn't because they're not actually commands. It can be kind of confusing. Below are some popular kinds of commands you might encounter. Command Prompt commands are true commands. True commands are programs that are intended to be run from a command line interface (in this case the Windows Command Prompt) and whose action or result is also produced in the command line interface. DOS commands, more correctly called MS-DOS commands, might be considered the purest of the Microsoft based commands since MS-DOS has no graphical interface so each command lives completely in the command line world. Don't confuse DOS commands and Command Prompt commands. MS-DOS and the Command Prompt may appear similar but MS-DOS is a true operating system while Command Prompt is a program that runs within the Windows operating system. Both share many commands but they are certainly not the same. A run command is simply the name given to an executable for a particular Windows-based program. A run command is not a command in the strictest sense — it's more like a shortcut. In fact, the shortcuts that live in your Start Menu or on your Start Screen are usually nothing more than an icon representation of the executable for the program — basically a run command with a picture. For example, the run command for Paint, the painting and drawing program in Windows, is mspaint and can be run from the Run box or Search box, or even from the Command Prompt, but Paint is obviously not a command line program. Some other examples are a bit more confusing. The run command for Remote Desktop Connection, for example, is mstsc but this run command does have some command line switches that make opening the program with specific parameters very easy. However, Remote Desktop Connection is not a program designed for the command-line so it's not really a command. Another command you'll see referenced that isn't really a command is the Control Panel applet command. A Control Panel applet command is really just the run command for the Control Panel (control) with a parameter instructing Windows to open a specific Control Panel applet. For example, executing control /name Microsoft.DateAndTime opens the Date and Time applet in Control Panel directly. You can execute this command from the Command Prompt, but the Control Panel is not a command line program. Recovery Console commands are also true commands. Recovery Console commands are only available from within the Recovery Console, the command line interpreter available only for troubleshooting problems and only in Windows XP and Windows 2000.